Hoping that you have all the craziness behind you by now (except for tonight, of course). I stayed up late making homemade Stitch ears for my 2 year old’s alien costume and planning the last of the Halloween food until next year. 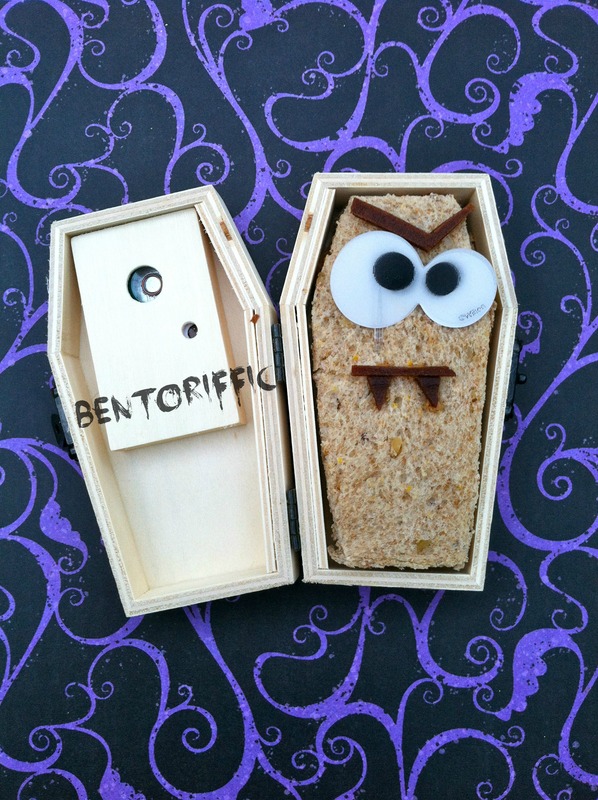 Ahh, the last of the Halloween lunches! 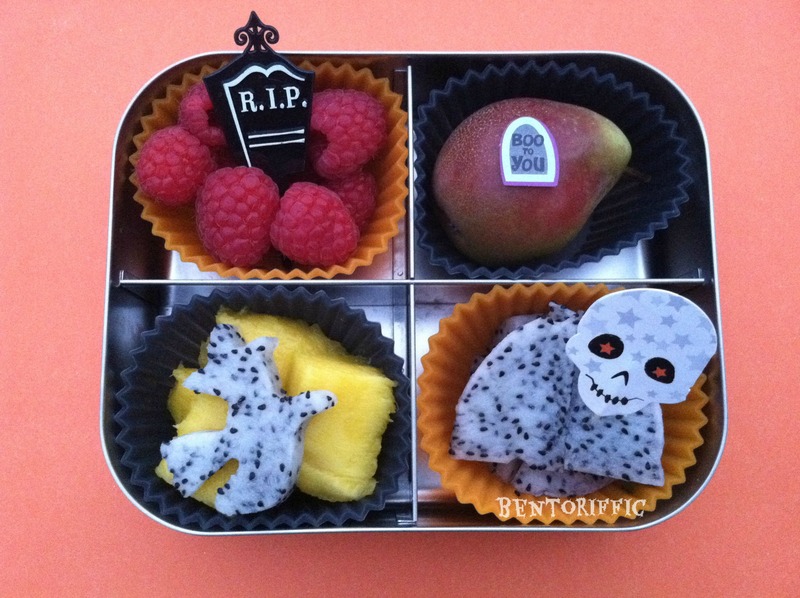 Miss G, the 4 year old, has a LunchBots Quad with raspberries and an RIP headstone pick, a seckel pear with sticker, dragonfruit pieces with a skeleton pick and at the bottom left are mango pieces with a dragonfruit witch. 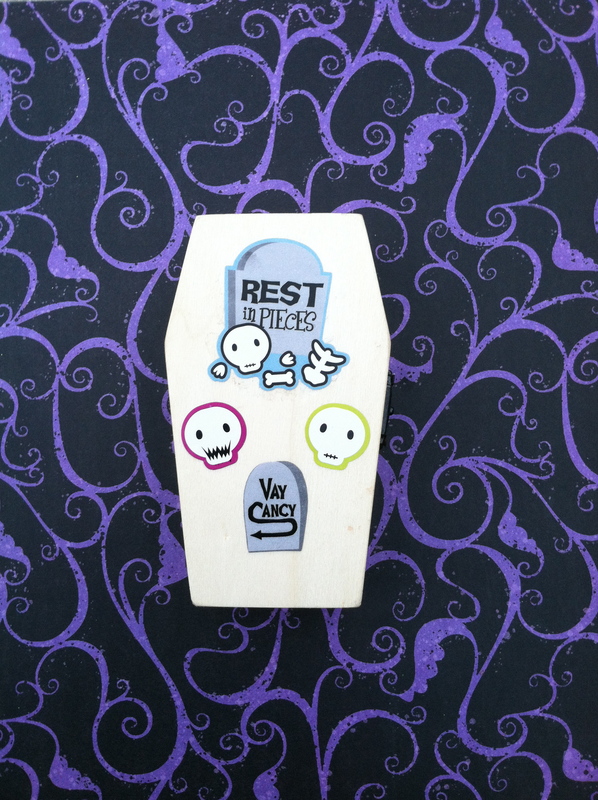 I found these little wooden coffins in Michael’s, and I finally put them to use. I decorated the lids with Halloween stickers for fun. 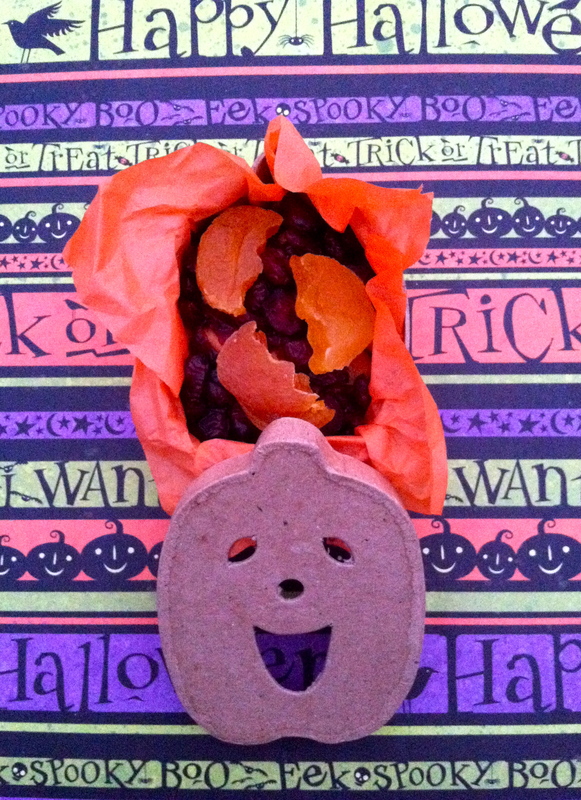 I hand cut the sandwich to fit inside, and added a Wilton googly eye pick and a fruit leather mouth. 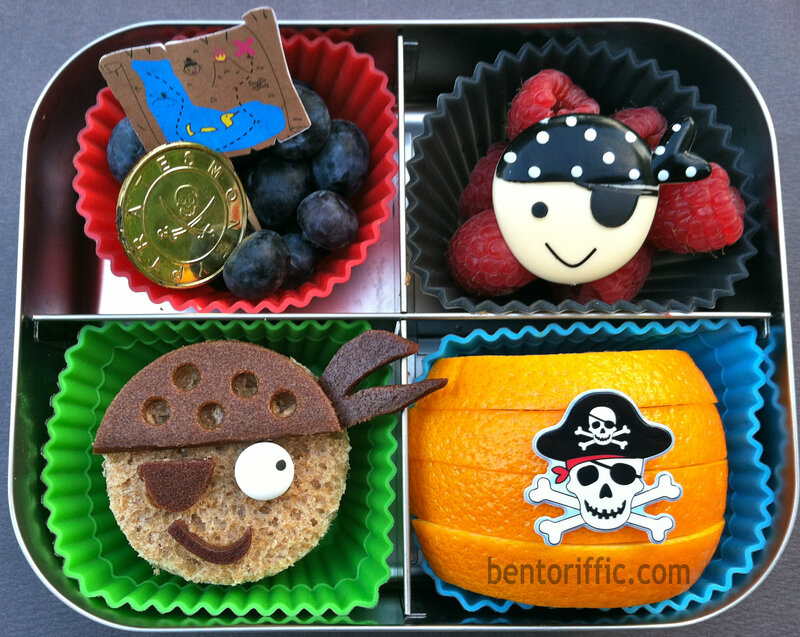 I also found these paper boxes for crafting at Michael’s, and I used them for snack bentos today. Miss G’s is a jack-o-lantern face. 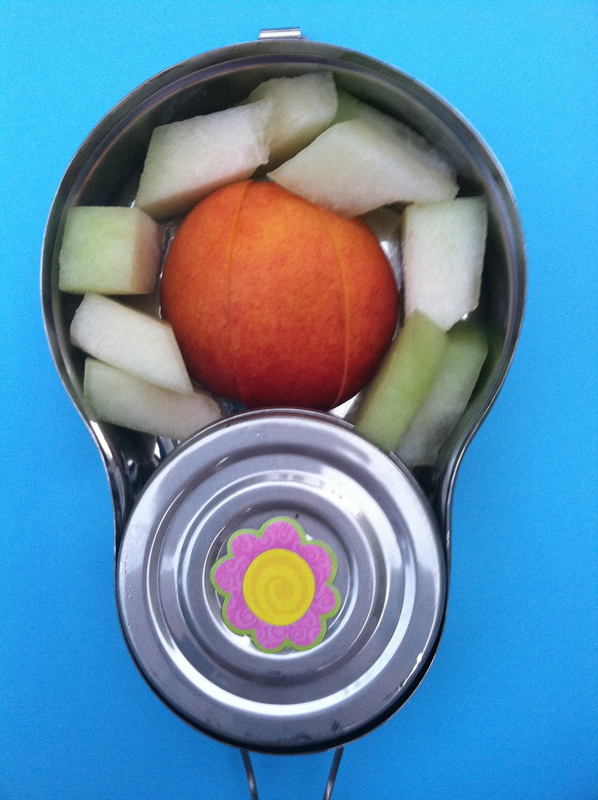 I filled it with cashews, dried cranberries and moon shaped dried apricots for her morning snack. 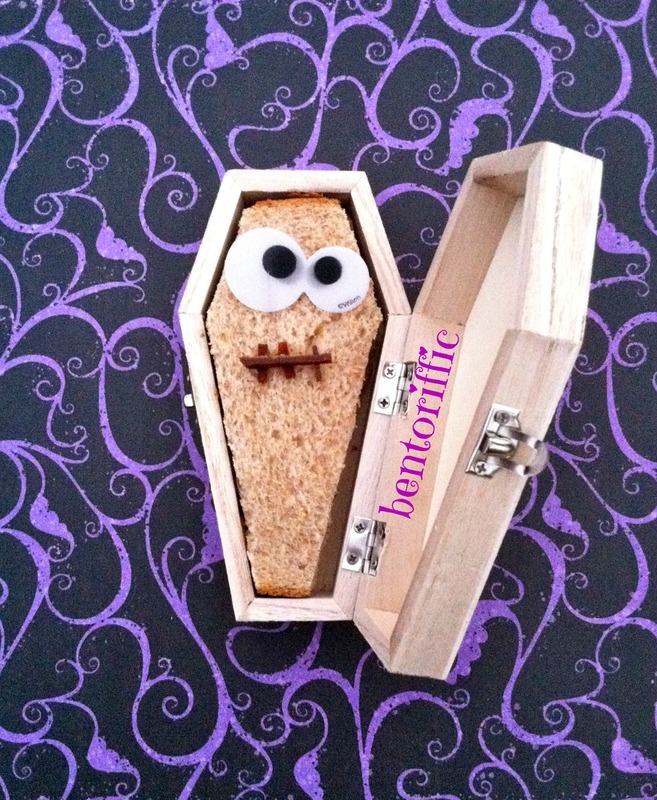 My 2 year old has a smaller wooden coffin for her sandwich. Hers is a light activated box. It cackles loudly when it opens which she loves. She also has an almond butter & jam sandwich with a Wilton eye pick and Stretch Island fruit leather mouth, eyebrows and fangs. 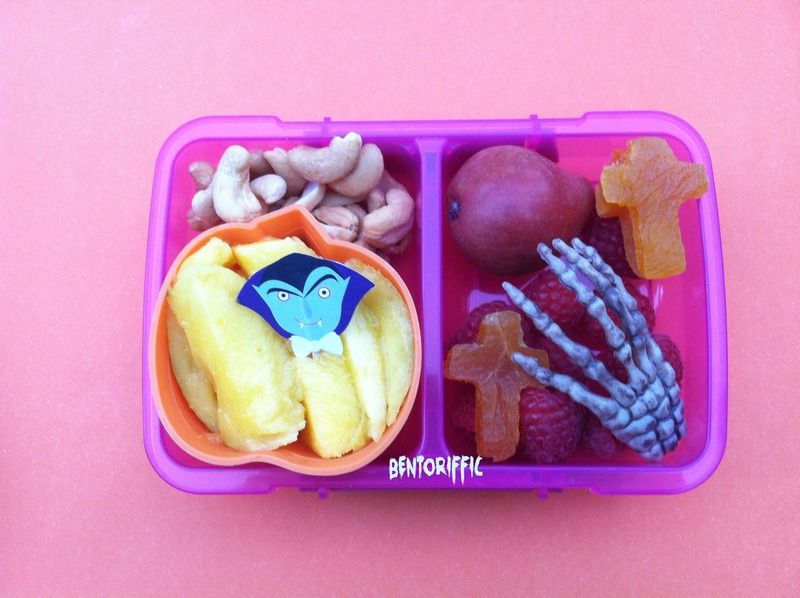 Miss A has a pumpkin cup with mango pieces and a dracula pick with cashews above. 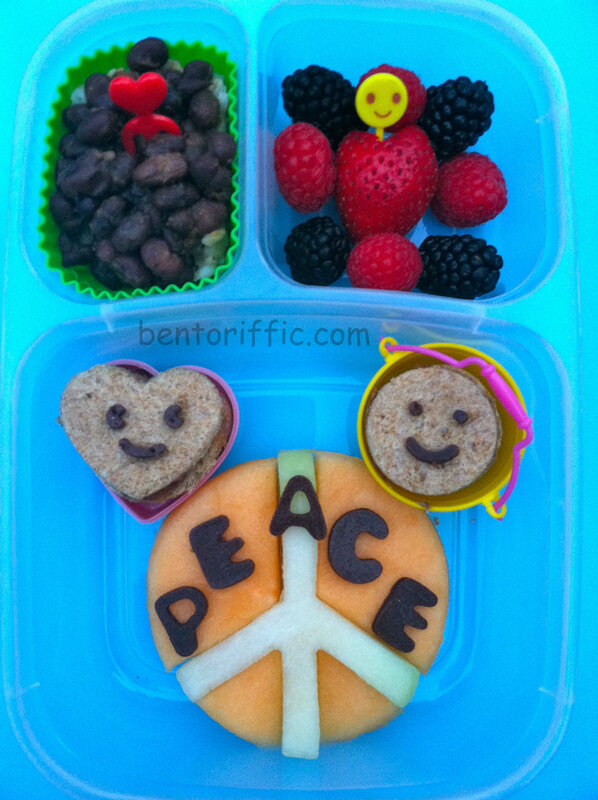 On the right are a seckel pear, raspberries, dried apricot crosses and a skeleton hand. 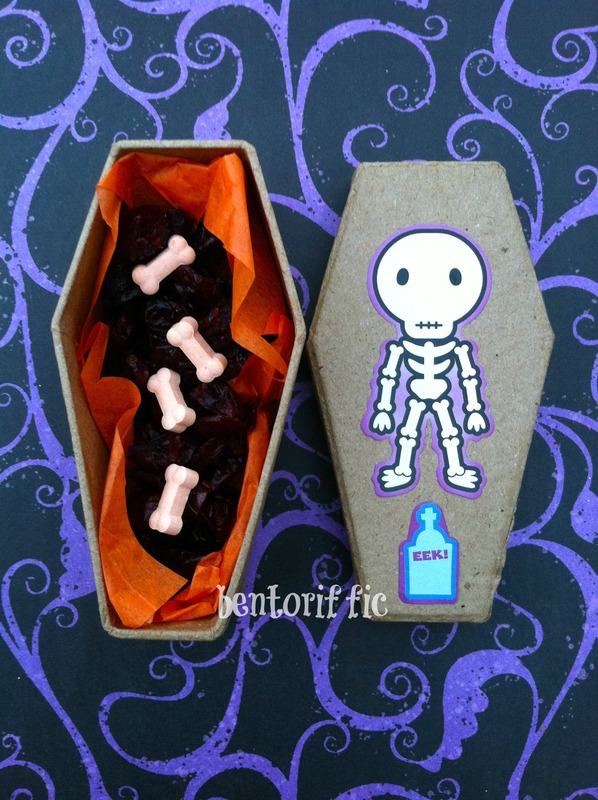 For her morning snack is a small coffin with dried cranberries and a handful of bone shaped candies. 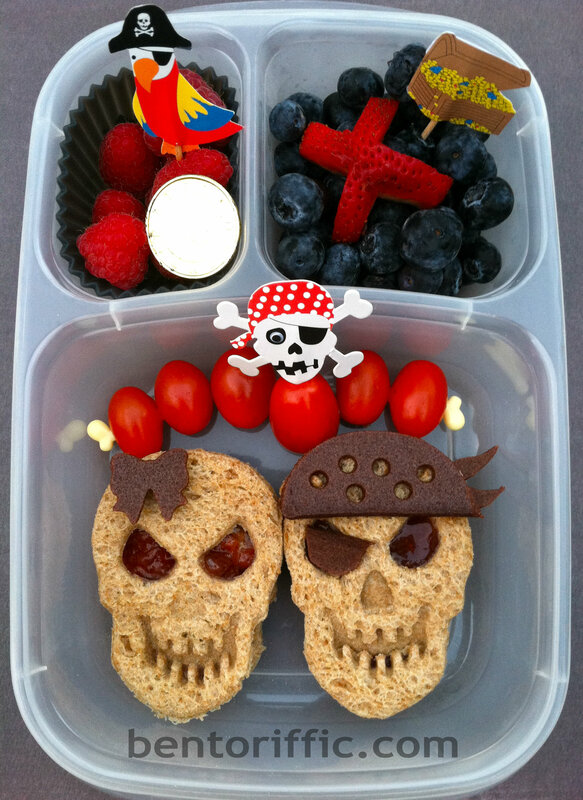 Need quick & healthy last minute Halloween snack ideas? Here are a few that your store won’t be out of if you need something fast. Raisins-They’re like nature’s sugar, you can use them to make eyes on just about anything. Raisins are full of vitamins, minerals and phytonutrients. Eating raisins can help your energy levels. They’re high in the best kind of natural sugars. They also promote healthy bones since they contain high levels of calcium. Clementine oranges or mandarin cuties-Mother Nature’s fast food. 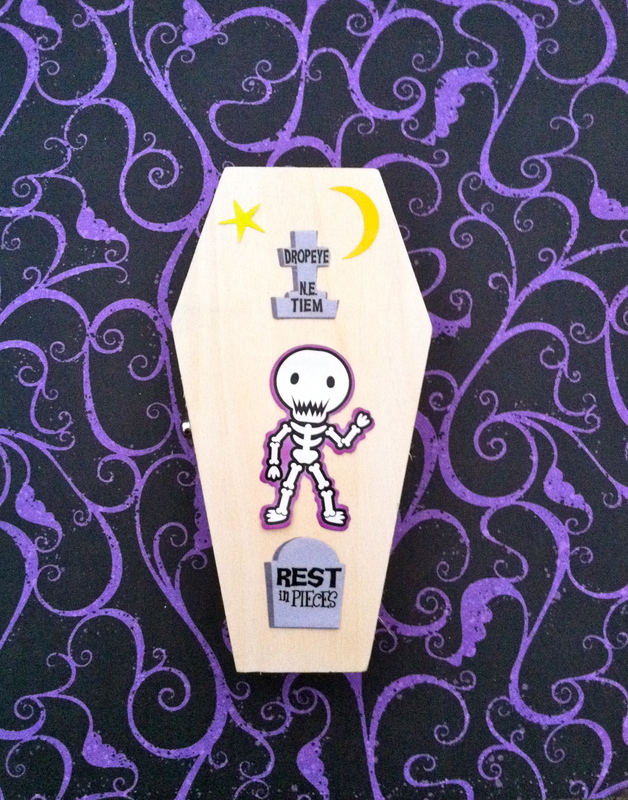 Grab a box or bag and a few Sharpie markers or a pack of fun Halloween stickers & get creative. 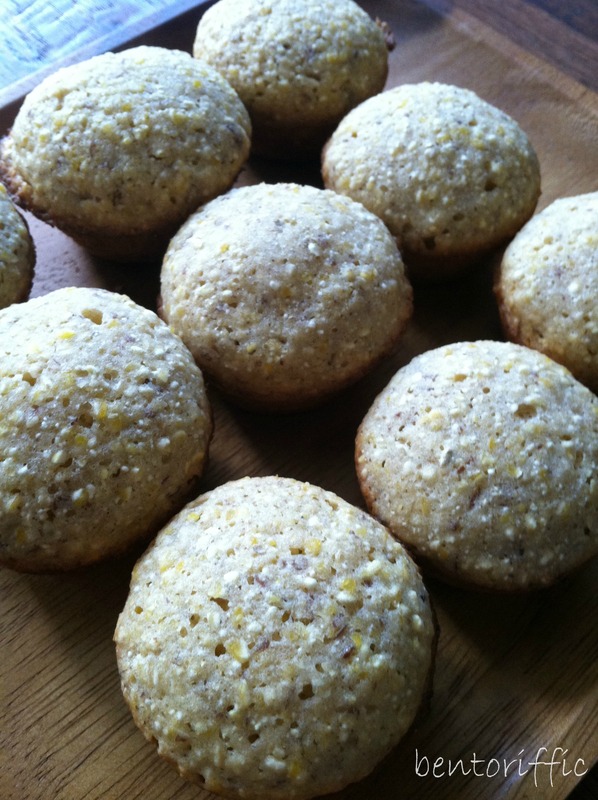 A basket of these are more appealing to little ones than you may think. For some reason stickers and fun faces make it enticing. 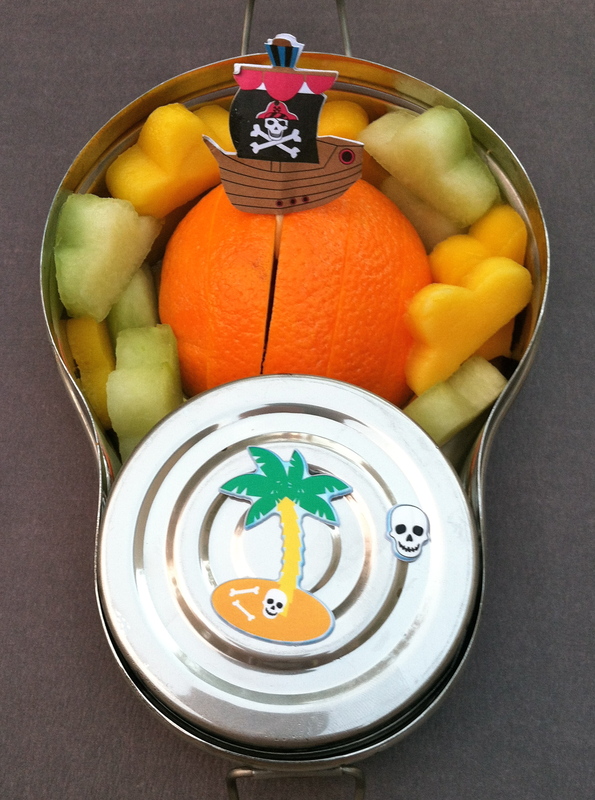 The best part is that they’re packed with nutrients like calcium, potassium and vitamin C.
We like to sprinkle a light dusting of sea salt or sometimes a bit of cinnamon on top for an afternoon snack. For my kiddo party later today, my neighbor and I are putting popcorn in witch hand shaped bags as a snack. Popcorn has more antioxidants than some fruits and vegetables so skip the heavy butter & oil and dig in! Pumpkin Seeds-Roast a few lightly salted seeds at home, and you’ll be snacking on these minerals: phosphorus, magnesium, manganese, iron, copper and zinc as well as vitamin K and B.
Wishing everyone a fun, safe & happy Halloween! 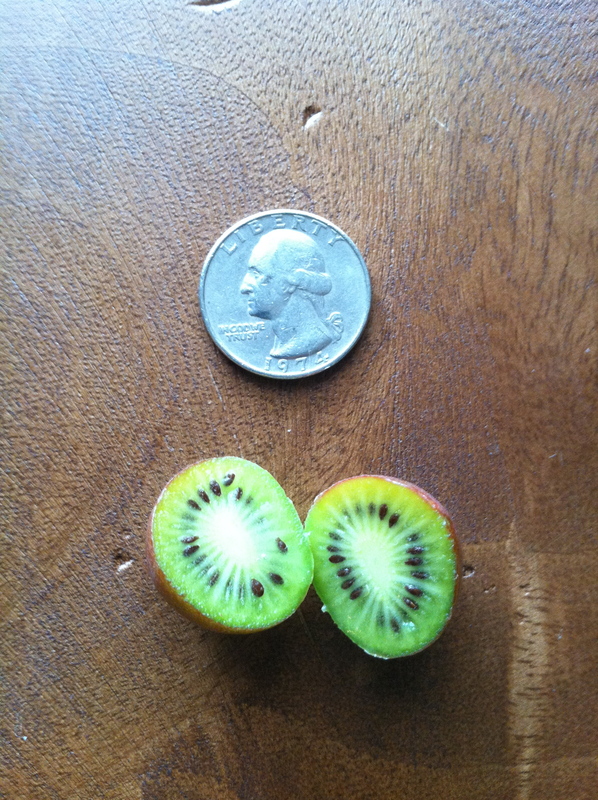 Last week one of my friends posted a photo of kiwi berries. I had never seen or heard of them so it was a must find for me! We love kiwi, and I was hoping the flavor was similar. I was lucky enough to find them at a stand at the local farmer’s market. They only had a few, but I’ll be back for more after trying them! 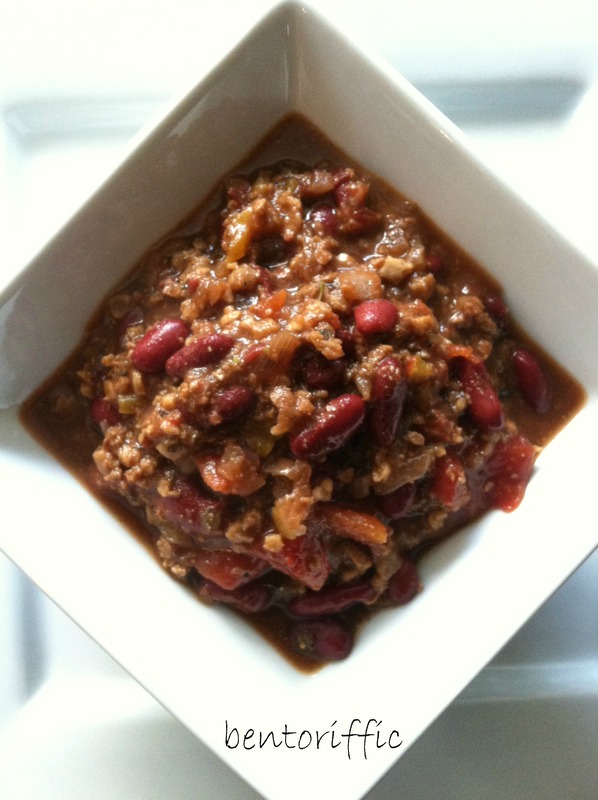 Here’s what they look like inside. 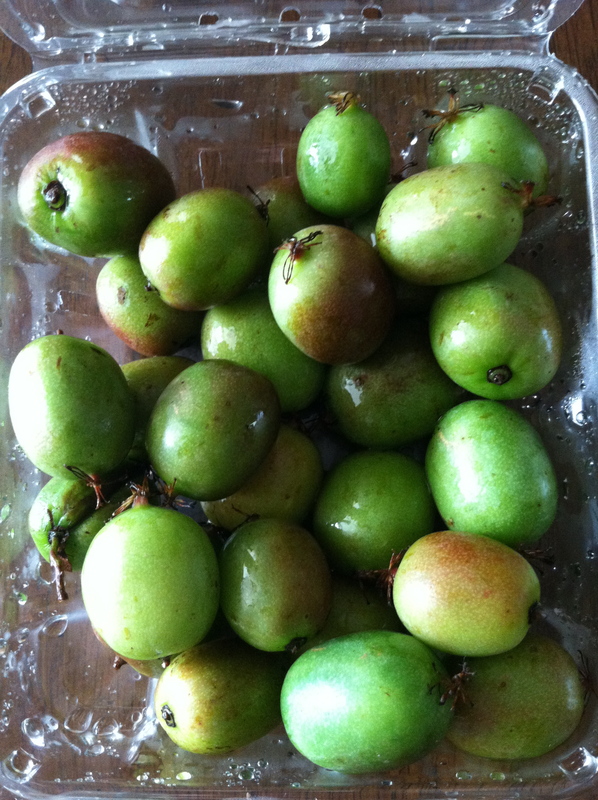 They are the size of grapes and sweet like kiwi without the fuzzy exterior. Just pop them in like grapes and eat. They have a very short season so if you’re lucky enough to find them, buy them and enjoy! 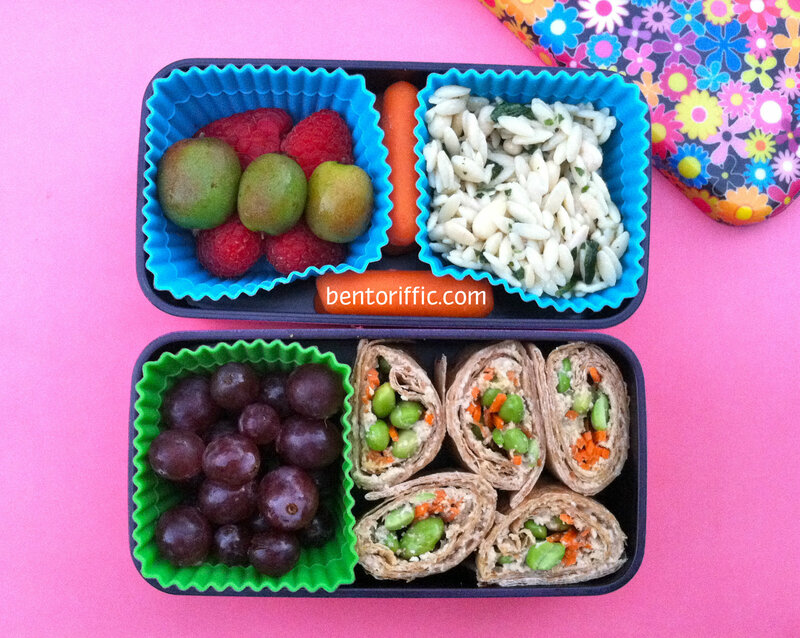 Both girls had the same wraps today for lunch. From the top left are raspberries and 3 kiwi berries on top. Inbetween the 2 cups are mini carrots and at the top right is a cup of lemon orzo. 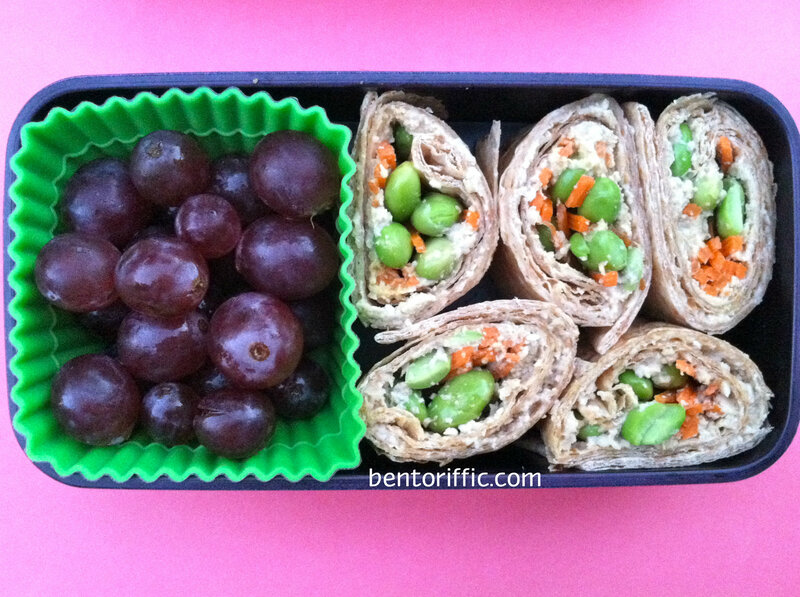 In the bottom container are red seedless grapes and the veggie wrap pinwheels. They are Rudi’s brand whole grain spelt tortillas. 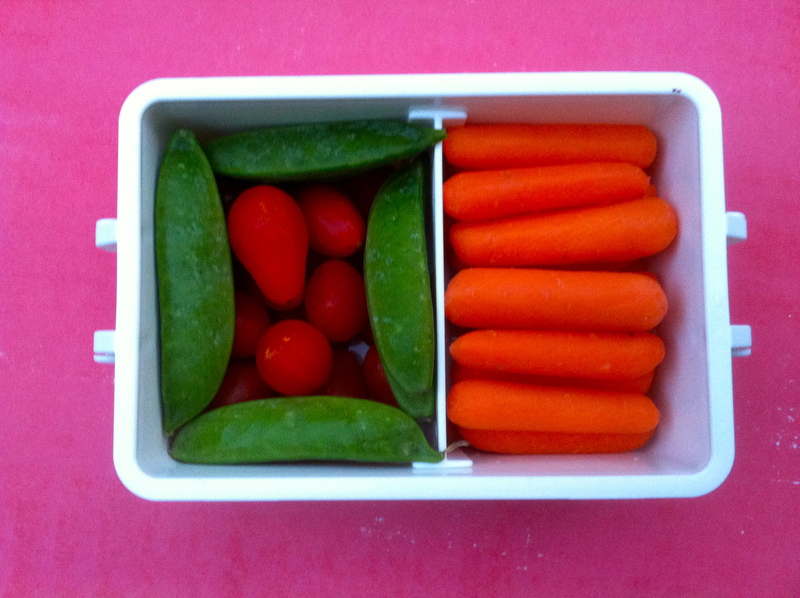 I used a homemade sunflower seed spread and added julienned carrots and steamed edamame. 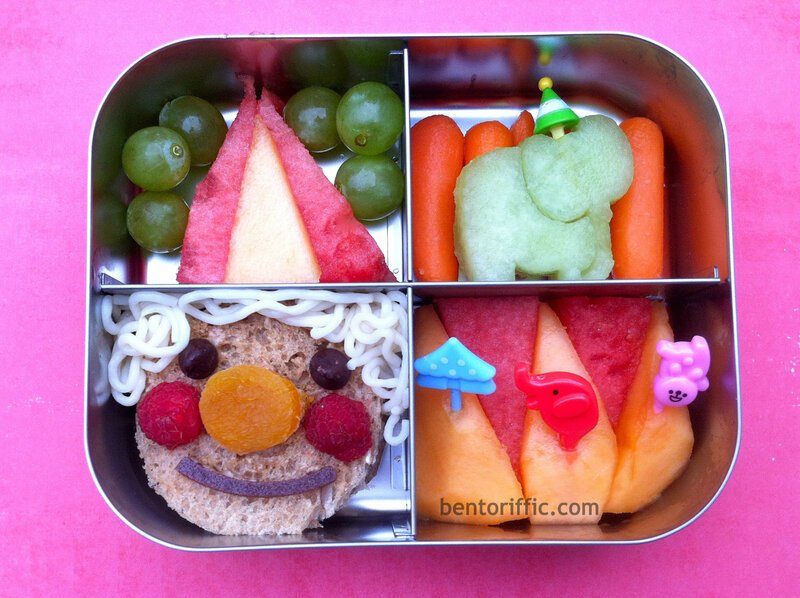 Below are Miss G’s snacks for school. 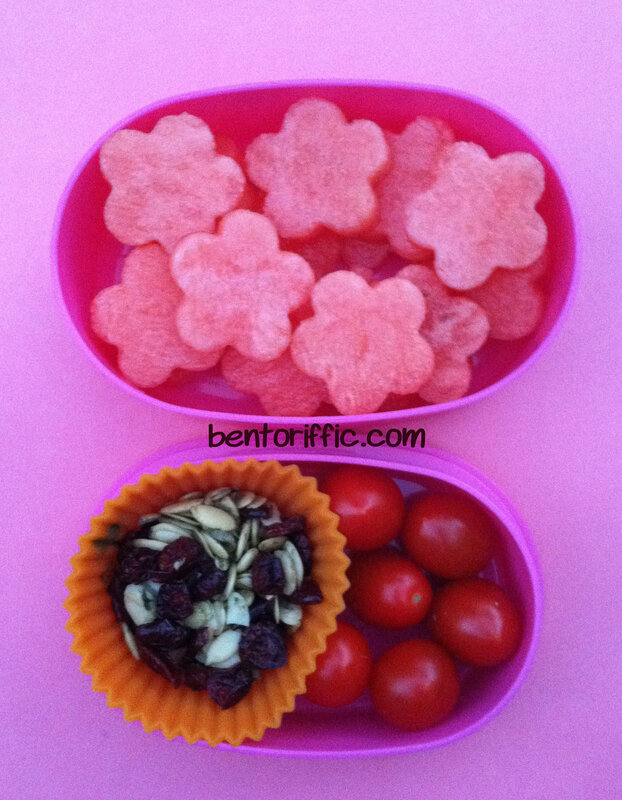 The top are watermelon flowers and the bottom is a cup of sprouted pumpkin seeds and dried cranberries mixed and grape tomatoes. From the top left are red seedless grapes with sliced strawberries on top. 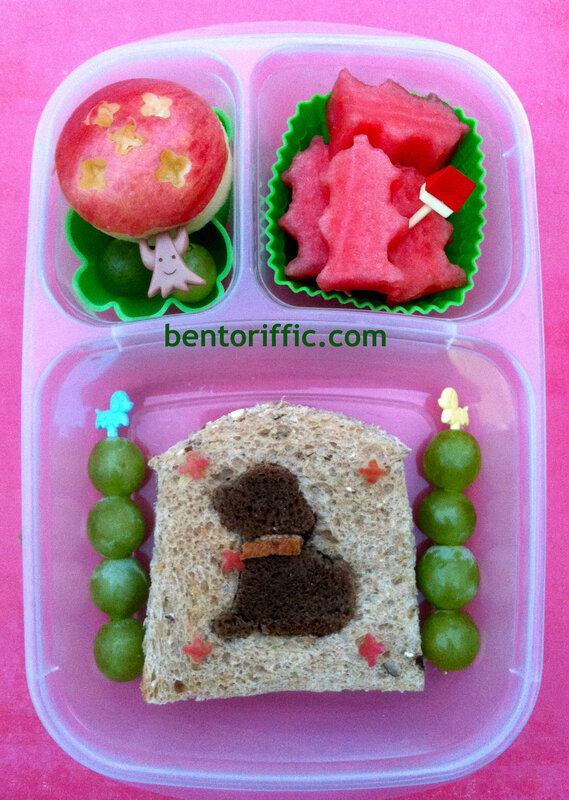 In the top right compartment are kiwi berries, 2 pieces of corn shaped mini cornbread muffins and 3 grape tomatoes. 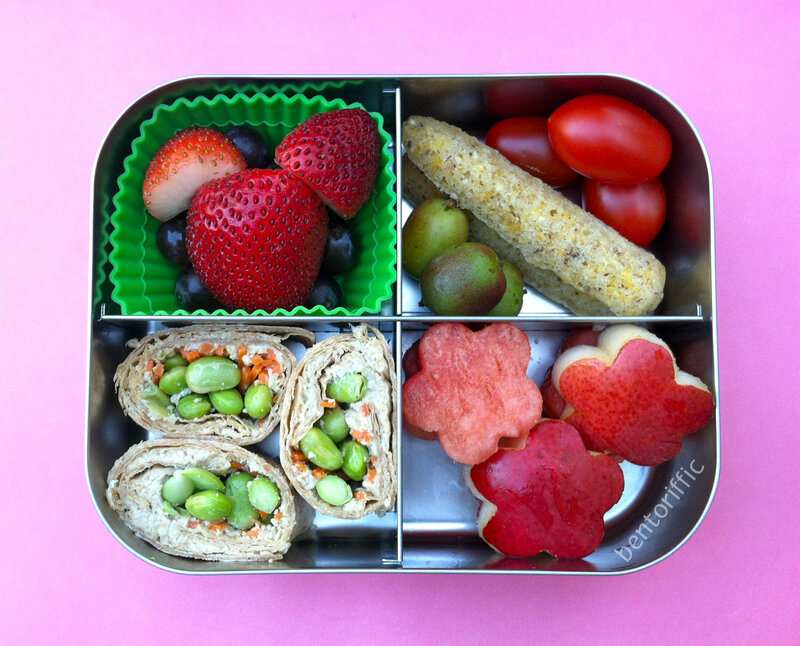 At the bottom right are watermelon and d’anjou pear flowers, and in the bottom left are the same edamame and carrot wraps at the bottom right packed in her LunchBots Quad.